The whole Maramureş region is a living “outdoor museum” famous for its unchanged way of life and for its well-preserved wooden villages and churches. It is perhaps one of the better-known regions of Romania – but still not much travelled. Our guidebook under preparation focuses on the famous wooden churches, UNESCO World Heritage sites, built during the 18th and 19th centuries. Besides describing each church in its own chapter, the book will have extensive chapters on the geography, history, traditional life, and religion of the region. 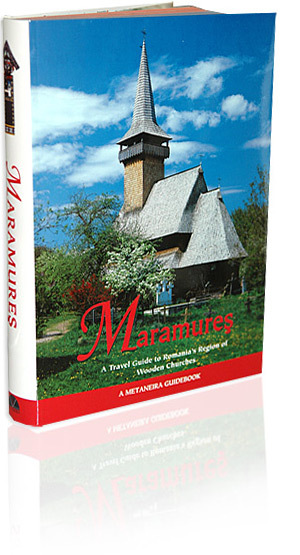 Also practical information, such as when to go to Maramureş, what to see, and where to stay, will have its own chapter. The book is of very high quality, with unique photographs. What you have seen on our pages on this site is a sample of what you will see in the book. Maramureş in northern Romania is one such little known corner of Europe. Amid beautiful rolling hills and lush river valleys live people who for the most part still follow the traditional agrarian way of life. Their life might seem hard and simple – and it is – a millenarian fight against the weather, to grow the crops, to raise the animals, to work from dawn until sunset without the many mechanized and electronic comforts we think are essential. But, that life can be rewarding in all its simplicity, as each day shows the results of work, and family and friends guarantee that there are often reasons for celebration. The seasonal festivities, like Christmas and Easter or local festivals and weddings, have retained their real value of breaking the everyday routine, and feasting lasts several days and is done with gusto. The people of Maramureş, the moroşeni, are very hospitable, always ready to invite visitors to their homes, to offer a glass of horincã, the local distilled drink, made of plums or apples. Their hospitality is famous, as is their willingness to socialize with friends, but also visitors. This makes Maramureş an “easy” and interesting place to visit, but also the fact that the people have maintained their traditions maybe better than any other group in Romania, still wearing the folk costume, weaving textiles, carving wooden objects, and so on. The traditional village was all built of wood, all houses, sheds, shelters, fences, gates and churches with their roofs of shingle. There are still some very well preserved villages that live in an organic harmony with the surrounding nature, the fields, the pastures, the meadows, the orchards and the forests. Today, many of the buildings are made with bricks, blocks and concrete, the roofs of corrugated iron. Fortunately, the scale of building is still small, and the structure of the villages hasn’t changed in time. And, if nothing else, at least the tall gates are still carved and raised before the houses as ever. We had therefore plenty of reasons to choose the land of Maramureş for our second volume in a series of guidebooks dedicated to areas where people and cultural and natural heritage are equally worth a visit. Why a guidebook and not another type of book? Because we consider that a cultural guidebook addresses those who, while enjoying a memorable holiday, can also help such a special region develop and maintain its specificity and character. To assure the preservation regions like Maramureş, it is necessary that they do not fall into total oblivion. It is necessary that the young people can remain, find work and live there with their families, while being at the same time aware of the importance of their inheritance. Cultural tourism can be a mutual investment that can bear fruit for everyone. The visitor’s joy and the host’s joy are both real experiences. The guidebook is thematically structured into several chapters: Geography, History, Life and Style, Architecture, Wooden Churches, Itineraries along the River Valleys, and Practicalities. Geography tells about the main geo-physical features of the region, as well as statistical data regarding population, surface, density etc, and information about the fauna and flora. History presents the evolution of the people living in Maramureş since times immemorial up to modern times, with a stress on the mediaeval times, the voivodate, and on the fact that it managed to maintain its autonomy throughout the centuries. Special attention is also given to modern and contemporary history, with the presentation of the strange fate of the region at the end of World War I when about two thirds of the region was lost, and to the communist period when this was one of the most important centres of resistance. Life and Style presents the traditional ways of living, which are still alive in this region that can be called a living museum. Architecture tells how both the houses and the churches were built, how the house is structured, and how the wooden parts are decorated with carvings. 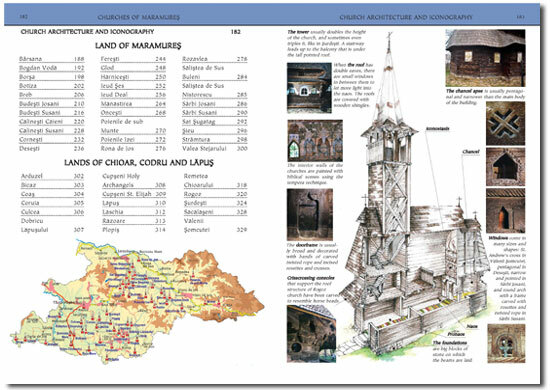 Wooden Churches describes nearly 30 churches in historical Maramureş and the neighbouring countries of Lăpuş and Chioar. Each church is portrayed on its own pages with photos of the exterior and the interior. Itineraries includes a series of journeys on each main river valley, as well as information about hiking, trekking, canoeing and other sports. Practicalities provides useful information as for what to eat and where to eat, where to sleep, with indicative prices and addresses. Hotels exist only in bigger towns, but there are private pensions and rooms where tourists can stay in the villages, and finding accommodation is not a problem. Maps of the area will show the most interesting places to visit. 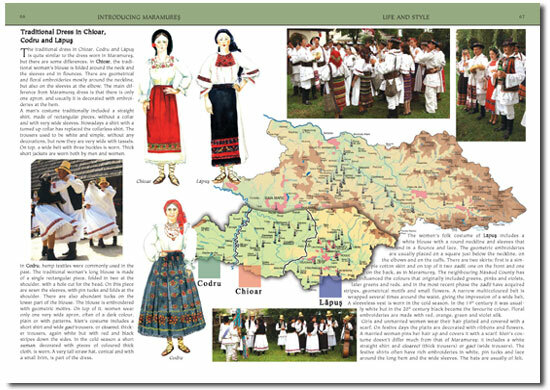 There is also a short glossary of Romanian language in the travel guide. We hope that you will enjoy your travel to Maramureş! Price 24.99 €+ shipping and handling. 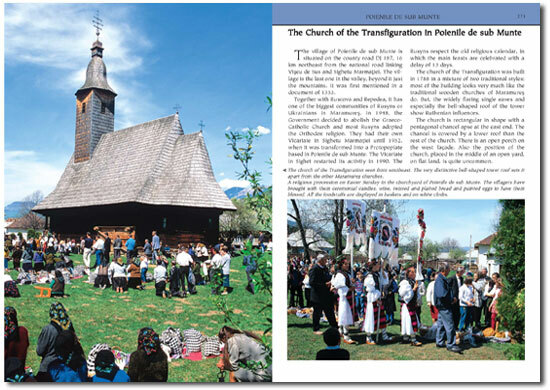 “We returned from our two-week stay in Maramures and Bucovina two days ago. I wish to once more thank you for your guides; they proved to be an invaluable help in understanding the paintings in Maramures churches and Bucovina monasteries, but also a way to communicate with local people. 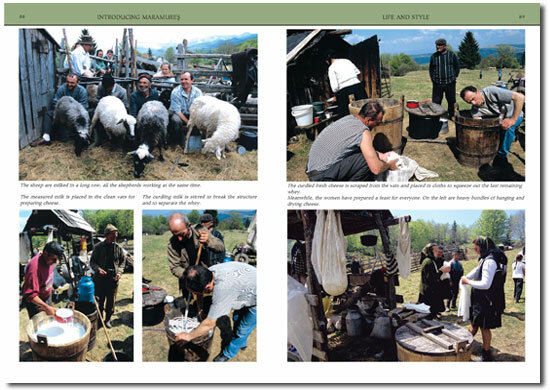 “Yesterday, I received the Maramures book. Thank you very much for the swift handling of my order. Please allow me to congratulate you and your publishing house with this outstanding travel guide. I‘m sure it will provide me many, many hours of reading and re-experiencing my recent trip to Maramures. To me, it seems like an incredible effort to compile this kind of elaborate, detailed and wonderfully designed guide –– especially with a relatively small group of contributors. It must have been a multi-year labour, I assume, but it’s still very much up-to-date, which I find remarkable for a guide on a region that’s experiencing rapid changes. Again, thanks a lot. I wish I had your guide before I went to Maramures, but unfortunately, for some reason I didn’t hear of it’s existence before. 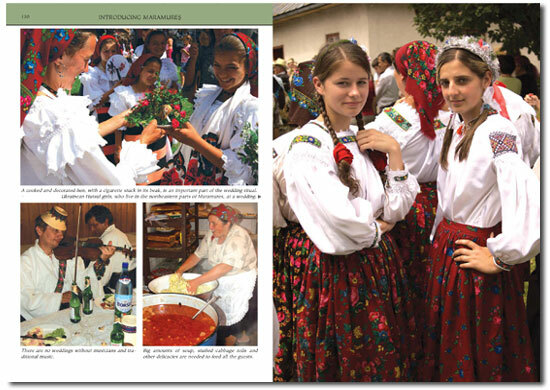 It was only when I talked to the director of the Maramures tourist agency in Sighet, that she showed me this book. 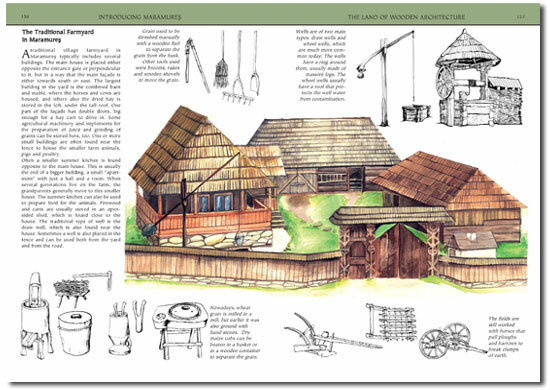 ““Maramures” is an excellent book, a rare mixture of proficient information, flowing descriptions, wonderful illustrations, everything based on a great concept. One can feel the love for this land coming out from every word from this book. Congratulations! The costumes are in white, red and black and these are the main colours of most of the folk costumes in the world – I suppose it is because they were so much easy to obtain by naturals means. The churches in the Middle Age were traditionally belt either by wood or stone depending on the economical and financial status of the country in question. We Romanians choosed wood mainly because of the quantity of forests we have in our country. Wood is resistant and easier to work to than stone. Each church has at least one tower. 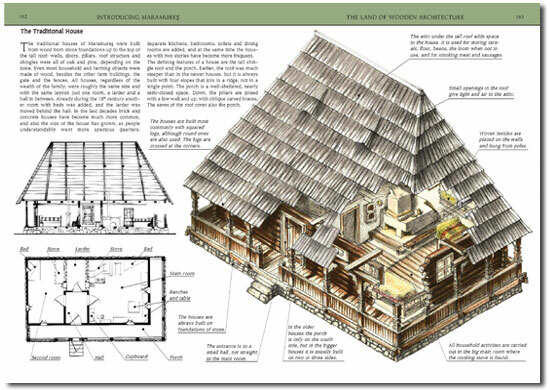 I would like to build a working replica of the Traditional Romainian home. I was in Cluj. I saw some Monasteries but I was not impressed. People are devoted but these Dog-Collared Antichrist Priests working for Mammon pretend to be working for God. In God, everyone is to give his own account to God. These hirelings retire from their services at 65 as any other person but how could they say that they are men of God? They are hypocrites causing all the sectarian riots. Watch my Youtube Videos under channel nijjhar1. I come across this site with this wooden houses and churches. I was supraised because I have never heard about it!!!! And it was so familer for me as a Scandinavian because it looks little Scandinavian with ours Wodden Viking churches mostly in Norway and the old wooden villages in Sweden and Norway. I most visit you in the future. Mayby is a historical connection from the Goths The Scandinavian Tribe living in Romania. How knows??? 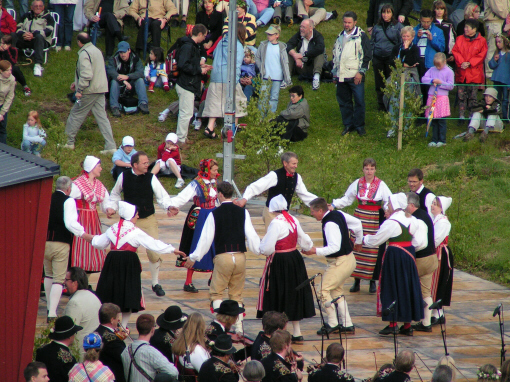 The folkcostums is also a little like some in Sweden and Norway. You cam look at the links below.